Once the transport arteries of the Industrial Revolution, today Britain’s northern waterways offer canal boat holiday-makers the chance to explore mill towns, unspoilt countryside, National Parks and vibrant historic city centres. At 127 miles long, the Leeds & Liverpool Canal is the longest single canal in the country. It crosses the Pennines and offers dramatic scenery, as well as exciting destinations like Leeds and Liverpool. Two of the ‘Seven Wonders of the Waterways’ waterways can be found along its length – the famous Bingley Five Rise Locks near Bradford and the magnificent mile-long embankment at Burnley. The Calder & Hebble Navigation meets the Rochdale Canal at Sowerby Bridge, and the Aire & Calder Navigation at Wakefield. It’s dotted with small mill towns like Brighouse and Cooper Bridge and offers boaters the chance to explore a popular area of Yorkshire with an abundance of natural beauty. The Shropshire Union Canal travels through the ancient City of Chester, with Roman walls, dazzling shopping arcades and the award-winning Chester Zoo. The canal ends at Ellesmere Port, where the National Waterways Museum offers visitors the chance to step back in time to discover the way people lived and worked at the port 100 years ago. The Trent & Mersey Canal stretches from the River Trent in Derbyshire to the River Mersey in Runcorn, passing through the Potteries, the Cheshire Plains and the incredible Anderton Boat Lift along the way. The peaceful Caldon Canal takes boaters from Stoke on Trent in the heart of the Potteries into remote moorlands, dense woodlands and tranquil water meadows. 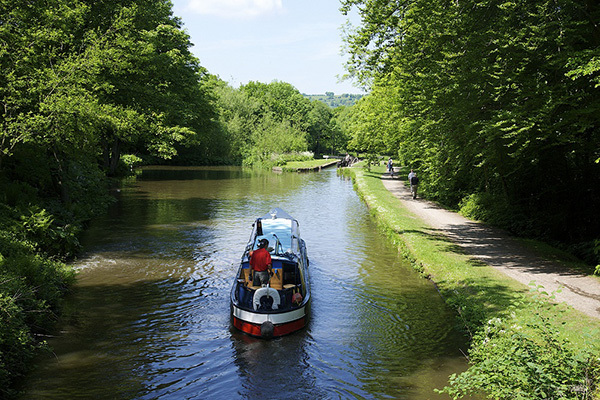 And the beautiful tree-lined Macclesfield Canal passes along the most westerly of the Pennine Hills with breath taking views, and connects with the Peak Forest Canal, where magnificent scenery unfolds as it passes along the edge of the Peak District National Park. On a short break (three or four nights) narrowboat holiday-makers can travel along the peaceful Shropshire Union Canal to the ancient City of Chester and back, passing through beautiful English countryside with historic local pubs to enjoy along the way. 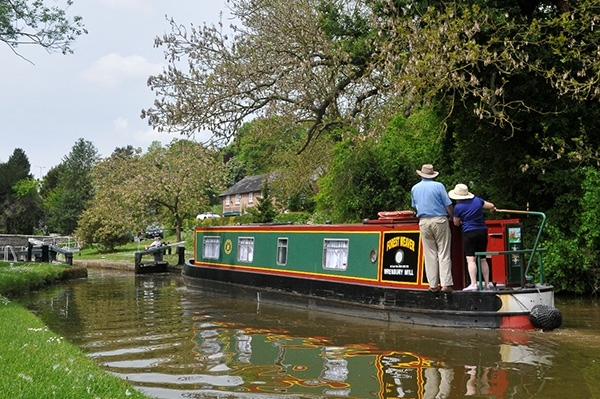 Short breaks are great way to test the waters if you are booking a canal boat holiday for the first time. There’s a great choice of relaxing ‘out and back’ destinations with very few locks, all perfect for beginners. But if you are a more experienced boater, there are also plenty of more challenging short break destinations to choose from as well, involving tunnels, lift bridges or flights of locks. On a week’s holiday, boaters can travel one-way across the Pennines, enjoying stunning scenery, the Leeds waterfront with its fascinating Royal Armouries Museum, the dramatic Five Rise of Locks at Bingley and Sir Titus Salt’s World Heritage Status model town at Saltaire. If you have seven nights to devote to your adventure afloat, we have hundreds of week-long holiday routes to choose from. Weekly breaks usually start on a Friday or a Saturday. You can choose an ‘out and back’ option or plan a journey around one of the canal boat holiday circuits. We also offer one-way seven night breaks across the Pennines, setting off from either Sowerby Bridge in West Yorkshire or Barnoldswick in Lancashire. 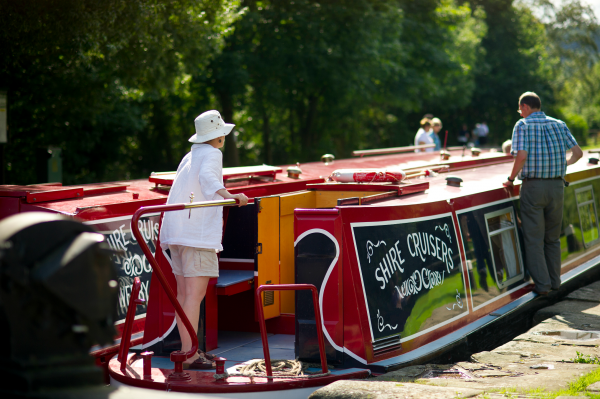 On a two-week break, boaters can travel the mighty Cheshire Ring, travelling 97 miles, through 92 locks, and enjoying 55 hours of cruising. 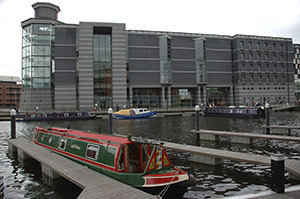 The route uses sections of six canals and passes through Manchester City Centre and rural Cheshire, with stunning views of the Peak District beyond. If you have 10 days, two weeks or more to explore Britain’s beautiful inland waterways, you can plan to travel some of the longer circuits, including the epic Pennine Ring. Or choose one of the shorter rings, for example the Four Counties or Cheshire rings, but allow more time for sight-seeing along the way. The Royal Armouries in Leeds has thousands of objects from across the world to admire, including Henry VIII’s ‘Horned Helmet’ and a 15th century Ming dynasty jian (sword). 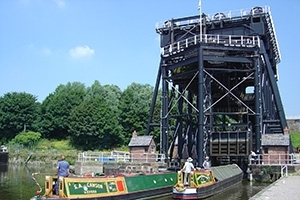 The Anderton Boat Lift, also known as ‘The Cathedral of the Canals’, lifts or lowers narrowboats 15 metres between the River Weaver and the Trent & Mersey Canal in two huge water tanks. 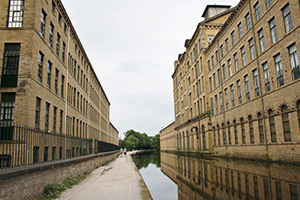 The Victorian industrial model town at Saltaire is now a UNESCO World Heritage Site. Here Sir Titus Salt built the textile Mill and entire village for his mill workers, all in a beautiful Italianate style. 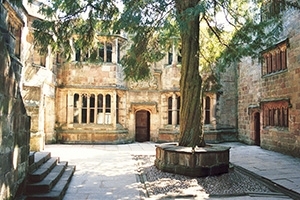 The 900-year old Skipton Castle is, one of the most complete and best preserved medieval castles in England, with extensive woodland trails to explore as well as the castle itself. 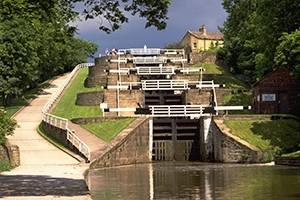 The Bingley Five Rise staircase locks on the Leeds & Liverpool Canal near Bradford, raise (or lower) boats 18 metres in five massive chambers. The locks open directly from one to another, with the top gate of one forming the bottom of the next. The Hepworth Wakefield showcases the extraordinary work of the British sculptor Barbara Hepworth, as well as works by other artists, including Henry Moore and David Hockney. 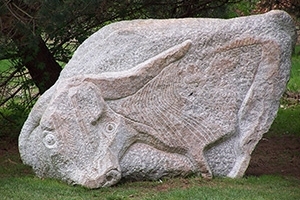 The Yorkshire Sculpture Park is also a short bus ride away from Wakefield. 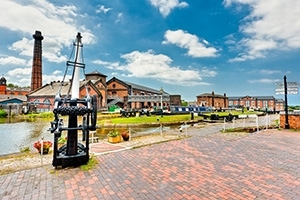 The National Waterways Museum’s impressive historic boat collection, docks, warehouses, forge, stables and workers cottages all bring the past vividly to life. 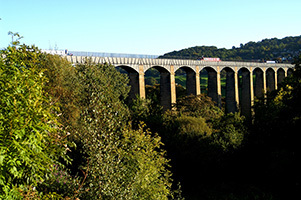 The incredible World Heritage Status Pontcysyllte Aqueduct in North Wales, carries the Llangollen Canal 38 metres high above the Dee Valley in a 300-metre long iron trough, supported by 18 titanic brick pillars.